Our Office/Patoka Station is located just outside the entrance to Newton-Stewart SRA, on the west side of Dillard Rd. Most Lodging, the Restaurant, and the Laundromat are located outside the entrance to Newton-Stewart SRA, across from Patoka Station, on the east side of Dillard Rd. 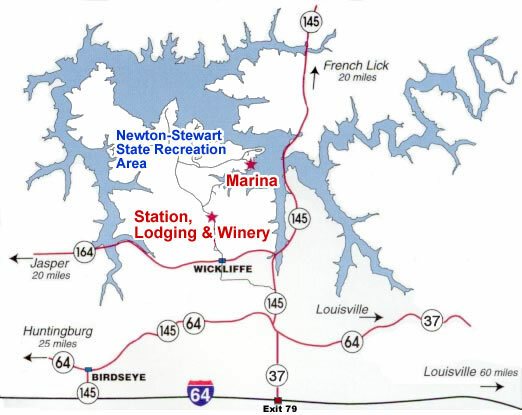 Patoka Lake Marina is located inside Newton-Stewart SRA. After passing through the entrance gate, take the second right (following the signs for the marina). Patoka Lake Marina and Lodging is located on the south side of Patoka Lake, within and just outside Newton-Stewart State Recreation Area (SRA). Come enjoy one of the gems of southern Indiana! For driving directions from Nashville, TN click here. To make reservations, please use our Reservation Request form. To ask for a donation, please use our Donation Requests form. If you are seeking employment, please use our Employment Application form. For general questions or comments, please e-mail us using the form below.